Orthopaedic & Spine Center is pleased to be the first Orthopaedic group in Virginia to offer Outpatient Total Joint Replacement (OTJR). We offer this service for hips, knees and shoulders. Outpatient Total Joint Replacement is exactly like traditional total joint replacement, except for a few differences in care after surgery. The major difference is that patients are released from the hospital to their home in the first 24 hours after surgery, rather than the traditional hospital stay of 2 to 3 days as an inpatient. In addition, a less long-acting anesthesia is used when the patient is in surgery. 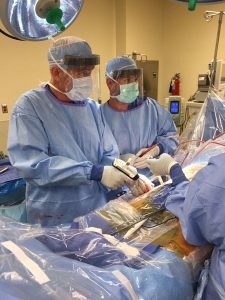 OSC can also perform partial knee replacement on an outpatient basis. How is this accomplished? The patient goes home with the support of an innovative At Home Nursing Program, which includes in-home Physical Therapy (PT), providing in-home nursing and rehabilitation care for the patient over the next several days. Vital signs are checked and all of the post-surgical monitoring, which is normally performed at the hospital, is performed by a nurse in the patient’s home. A Physical Therapist also visits the patient’s home twice a day for several days to help work on range of motion and flexibility exercises. Home PT continues, as normal, for the next several weeks until the patient is released to travel to an Outpatient PT clinic. A good support system at home, such as family or friends who can help with Activities of Daily Living and transportation. 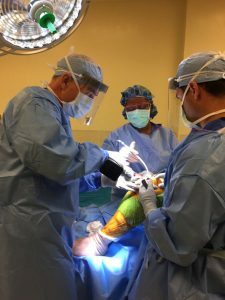 If you are considering joint replacement and are interested Outpatient Total Joint Replacement, a consultation with one of our surgeons is your next step. They will help you determine if the OSC Outpatient Total Joint Replacement program is right for you. Just call our appointment number at 757-596-1900 and ask for a consultation appointment for OTJR.